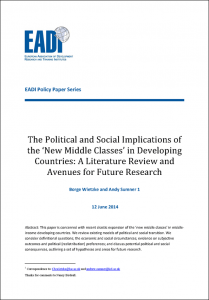 Borge Wietzke and Andy Sumner researched the drastic expansion of the new middle classes in middle-income developing countries. Reviewing the existing models of political and social transition, their work is preparing all conference participants for the various discussions at the 14th EADI General Conference. Please download the full paper. This entry was posted in News on 05/06/2014 by gc2014. The New Geography of Inequality: Is it all about the Middle or all about the Tails? Background Paper on "The Political and Social Implications of the ‘New Middle Classes’ in Developing Countries"
For questions about the conference organisation please contact the via Conference Team.